The Kentucky Bill of Sale Forms are considered legal documents to show proof that items have been legally purchased and sold between two parties (dealer or private party) and that change of ownership has been authorized. Some documents may require notarization, therefore, unless all signatories are before a notary, it’s advised that all signing parties withhold any signatures, until all parties are in the presence and witness of a notary public. Boat Bill of Sale – This form would provide all information to prove that a vessel has been sold and purchased legally, also providing all required registration information. Firearm Bill of Sale – To be used to provide a change of ownership and prove that a firearm has legally been purchased. General Bill of Sale – This document is usually employed by two (2) private parties to show proof that any personal item(s) have been legally procured, also serving as a receipt if needed. 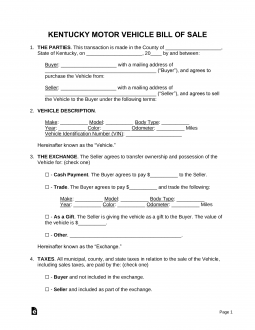 Vehicle Bill of Sale – Would be used to provide all information needed for registration and to prove current ownership and legal sale of the car/auto/motorcycle. The applicant must also pay a $20.00 fee made payable to the Sheriff’s Office in your area of residence and a $40.00 check or money order made payable to the Kentucky State Treasurer. Your total fees will be $60 application fee at the time of application. Active and retired officers of the peace that meet the requirements of KRS 237.110(7) are exempt from paying the application or renewal fee – Any application that is not accompanied by a check or money order for $40.00 payable to the Kentucky State Treasurer will be returned, unprocessed, to the sheriff of the applicant’s county of residence. Note* – Titles issued February 2000 and after will have the transaction and change of ownership transaction form on the back side of the title that May be completed, in place of the application for title and registration.